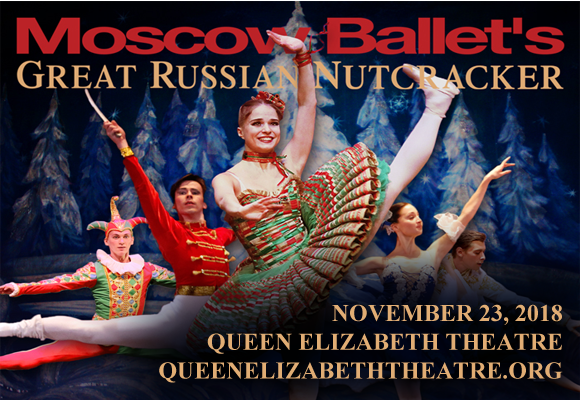 Queen Elizabeth Theatre brings you the jaw dropping beauty and elegance of Moscow Ballet's Great Russian Nutcracker! Telling the timeless story of Masha and her Nutcracker Prince on their adventure into the Land of Peace and Harmony, this unique interpretation of Tchaikovsky's classic two-part ballet suite will bring your dreams to life! Experience this lovingly-crafted stage show on Saturday 10th November 2018 – tickets available now! "Expansive… transcendent music… the Russian style is elegantly generous." "Technical prowess was truly "great”… Whimsical sets and giant animal stick puppets and colorful costumes …stellar Arabian Variation …breathtaking!